When it comes to performance management, managing the performance of your processes can be your best avenue for driving performance gains. Identification of key business processes is critical to organizations as they execute your strategy by aligning the results of these processes with the strategic goals. Key business processes are those processes which have maximum impact on the success of your organization. Key processes are those that move you closer to your goals and have the greatest impact on your organization. In other words, these are the processes which would seriously impact revenues, should they fail. This article examines the steps necessary to manage and maximize the efficiency of your key processes. A typical organization should only have less than 15 key processes. A few will be the generic processes within your industry, while others will be specific to your unique approaches, goals, service, geographic location, policies, etc. In my experience, organizations are aware of most of the processes that drive their success. Unfortunately, there are often many processes which have an equal or greater impact on the organization which never receive the attention they deserve. Many times, it’s these latent processes that keep organizations from performing up to their potential. Identifying key processes using a structured approach, aligning their outcomes to deliver the business goals, designing appropriate measures and allocating sufficient resources for their improvement is the key to the success of an organization. Many organizations struggle to identify their key processes. Most people within organizations understand their team’s function within the organization, but they do not understand how their team’s function interacts with other group functions. Business processes are streams of activity that flow across functional boundaries. For this reason, business processes are said to be fragmented, or scattered across functional silos. This is where the performance management team’s services are so valuable. Assigning a process engineer as part of the performance management team can enable you to standardize processes and bridge the communication gap that exists between functional support groups. Below is a 10 step process for managing key processes that drive business success. Every performance improvement initiation starts with a baseline. You must first know how well your organization currently executes your key processes before you can fully understand what you need to do in order to reach your desired level of process execution. This is the foundation and gives you your starting point for where you need to improve. 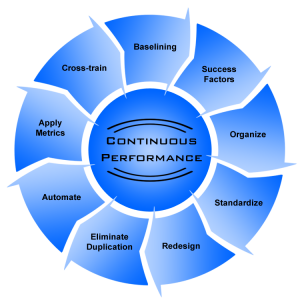 •Measuring performance – in order to truly understand your process execution, you must be able to measure your processes from start to finish. In order to fully understand how processes interact with one another, your processes must be organized. It used to be that each department managed their processes with very little interaction with other divisions. But in today’s fast paced business models and the need for instant process execution, it is vital that organization’s consolidate, standardize and manage cross-functional processes. This requires centrally locating processes and taking a look at the big picture. Often times organizations have similar processes that are executed by multiple divisions and teams. One division may be extremely efficient at executing that process while another division executes at a much lower efficiency rate. Unfortunately, many organizations don’t standardize their processes. By leveraging the processes that strong performing divisions employ and standardizing those processes among weaker performing divisions, the entire organization can benefit from extraordinary performance gains. This is where we take action. Once we’ve baselined and measured our processes, we are now ready to take action. Identify the inefficient processes within your organization and the processes that do not support the organizational goals and objectives. If you have a small organization or limited manpower, you can take one process a time. You’ll see that over time you will have redesigned several processes and the impact will be clear. How many times have you worked on a process that was flawed and you found a workaround? It’s amazing the things we will do patch up a process error to get the job done. It always amazes my clients when we map out a process and find all of the inefficiencies and duplicate steps. I’ve seen some processes where two divisions basically passed ownership back and forth until it came to an escalation point and a decision was made by senior management. You’ll be surprised at how much time you can cut out of a process when these flaws are mitigated. This is the name of the game. The more automated your processes, the less chance for human error and the more predictive your performance will be. This sometime requires a significant investment. But in an age where we want things done yesterday, the investment is most times well worth staying ahead of your competition and establishing customer loyalty. This is where we quantify how effective our processes are. Establishing performance measurements for your key processes, especially those that span across multiple organizations will significantly improve your performance. How many times have you evaluated a failed process only to get the usual finger pointing across the divisions involved? When you can break down a performance measure and understand how much time it should take for each division (or individual) to execute their part of the process, then you can assign accountability. And accountability often means results. Understanding how each employee’s function impacts the function of other division is the first step in gaining synergy among your employee and the processes that drive your organization. So, you’ve baselined and centralized your processes. You have standardized where possible. You have eliminated inefficiencies and workarounds. You have applied metrics, automation and cross trained employees so that they understand their role in the bigger picture. Now it’s time to do it all over again. 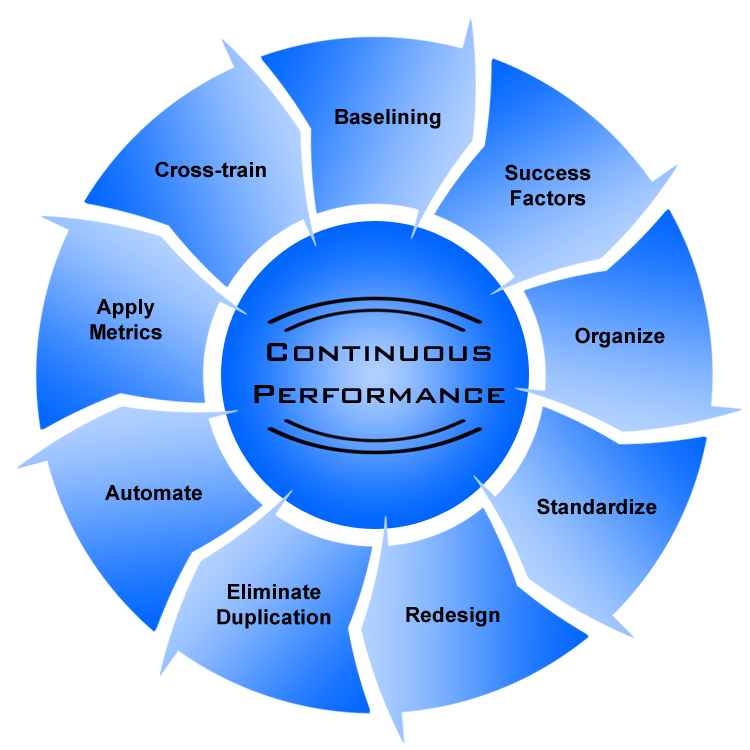 Remember, process improvement is a continuous process. Your competitors are going to keep getting better, faster, more efficient and you must too.